Payne, Matthew Thomas & Michael Fleisch. “Stories from the Seats of Power: Chopper versus Chopper as Dueling Travelogues.” Well Played: A Journal on Video Games, Value, and Meaning 2.1 (2012). 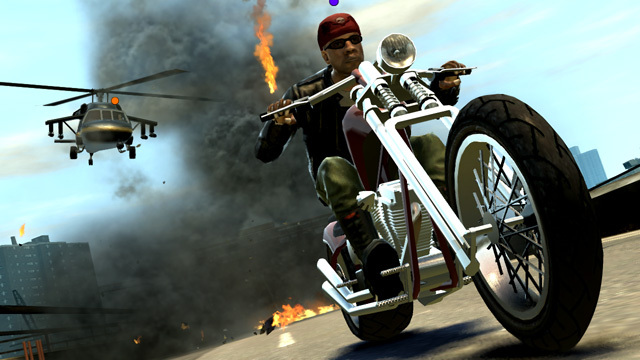 The “Chopper versus Chopper” multiplayer game mode included in Grand Theft Auto IV’s expansion pack, “The Lost and the Damned” (2009), pits one gamer on a motorcycle against another piloting an assault helicopter in alternating rounds where the pilot must eliminate the biker before the latter scores points by crossing a series of checkpoints. The design of this one-on-one game mode is notable for elegantly distilling a massive and complex synthetic environment into a singularly focused affair between two combatants that fosters competing ways of seeing and understanding their shared space, as well as inciting emergent narratives of narrow escapes and fantastic collisions that draw gamers back round after round.